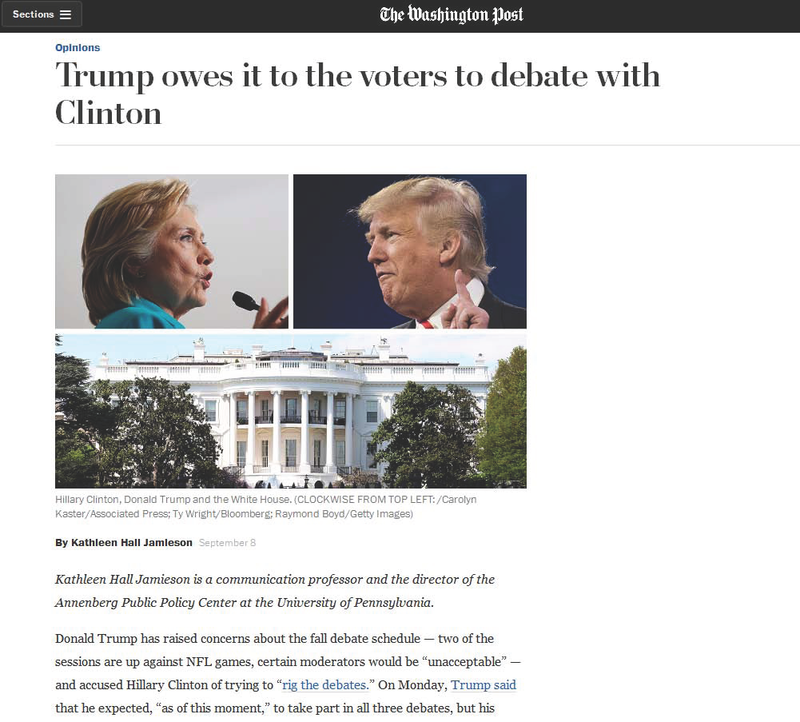 In an op-ed in the Washington Post, Kathleen Hall Jamieson said debates were essential to voter understanding, and said it was important that Republican presidential nominee Donald Trump participate in all three general election presidential debates with Democratic nominee Hillary Clinton. In the op-ed, “Trump owes it to the voters to debate with Clinton,” published on September 9, Jamieson wrote that the debates provide a critical opportunity to help voters to make sense of the candidates’ stances on issues and predict what will happen if the candidates are elected. Jamieson was also one of the APPC researchers to work on the recently released white paper, “Presidential Debates: What’s Behind the Numbers?,” which analyzes data on the television audience, ratings, and motivations of viewers of general-election presidential debates. The paper was researched and written by Jamieson, former Nielsen executive and former APPC visiting scholar Jo Holz, and APPC postdoctoral fellow Heather Akin.